How many times have your students made errors in their spelling, mechanics, or usage, even though they have been taught the rules for years? Many teachers are tempted to “get back to basics” and teach everyone the concepts again, but that’s not a good use of your time, and it forces too many students to sit through instruction they simply don’t need. What’s more effective is to teach these conventions in the context of meaningful writing, giving each student the exact instruction they need. But that kind of precise differentiation takes a lot of time. A Grammar Gap Filler is a small, powerful package of materials that teach a single spelling, grammar, or usage rule. Gap Fillers are designed to let students review just the skills they need, on their own, and then get back to writing. When you notice a student making a particular error, simply assign that student the right Gap Filler and you’re done. ✔ A short VIDEO (4-8 min) that reviews a single concept in clear, simple language, offering mnemonic devices so students can remember the rule later, plus four review questions at the end of the video. Each video is available with and without closed-captioning. ✔ A 10-question SELF-CHECK, plus an answer key, that allows students to quiz themselves on the concept they just learned, then check their answers independently. A link is also provided to a Google Form version of the Self-Check, so students can take it online and get instant feedback about their responses. ✔ A one-page CHEAT SHEET, giving a quick overview of the concept, which students can keep in their notebooks for future reference. 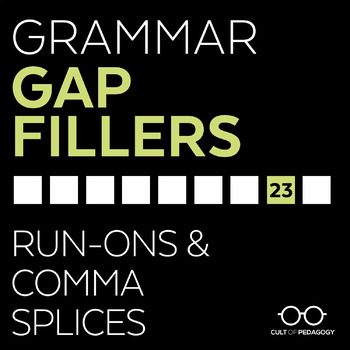 ✔ A TEACHER’S MANUAL providing an overview of the teaching philosophy behind Gap Fillers, teaching tips to help you make the most of this resource, and instructions for setting up Gap Fillers in both paper-based and paperless environments. Plenty of written resources already exist to teach these concepts, but text alone can’t always explain things as clearly as a video, which walks the viewer step by step through a concept. Unfortunately, many videos you find online contain ads, have poor quality audio or visuals, or may not explain things in the simplest, clearest way. Grammar Gap Filler videos have been created with an emphasis on simplicity, clarity, and consistency, so students can get what they need in just a few minutes, then get back to writing. Videos can be integrated with any kind of unit and uploaded into online platforms like EDpuzzle or learning management systems like Edmodo. The Self-Check is designed to allow students to complete a whole lesson independently, without the need for teacher assistance. Students who are learning English will appreciate having a library of clear resources that explain these sometimes confusing English concepts. The closed captioning option for all videos makes them accessible to students with hearing impairments, students who don't happen to have earbuds, or those who simply prefer to read as they watch. The Self-Check and its answer key can be printed and stored in a physical filing system, but they are also available in a Google Form, so if your classroom is going paperless, your students can do the Self-Check completely online. The Teacher's Manual shows you how to set up all of your materials in either environment. I taught English language arts for over 7 years and have earned National Board Certification in Early Adolescence/English Language Arts. I am intimately familiar with the most common mistakes students make in their writing AND with the research on best practices for grammar instruction. To learn more about this approach, read my blog post, How to Deal with Student Grammar Errors.